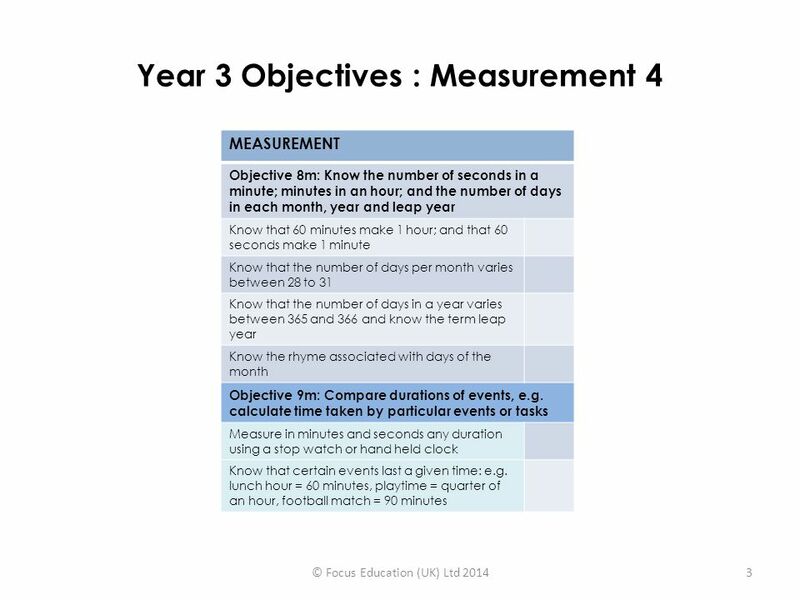 Download ppt "Year 3 Objectives : Measurement MEASUREMENT Objective 1m: Measure, compare, add and subtract: lengths (m/cm/mm); mass (kg, g); volume and capacity (l/"
Maths Test Revision You will do a paper A without a calculator and paper B with a calculator and a mental arithmetic test. Understanding Good Progress in Mathematics. Four Elements 1. Using and Applying 2. Number 3. Shape, Space and Measure 4. Data Handling. Telling the time Analogue clocks. Literacy Reading Spelling Pupils should be taught to: use further prefixes and suffixes and understand how to add them spell further homophones spell words. The Concept of Learning Challenges Presenting Targets as Questions 1.They automatically insist on deep thinking. 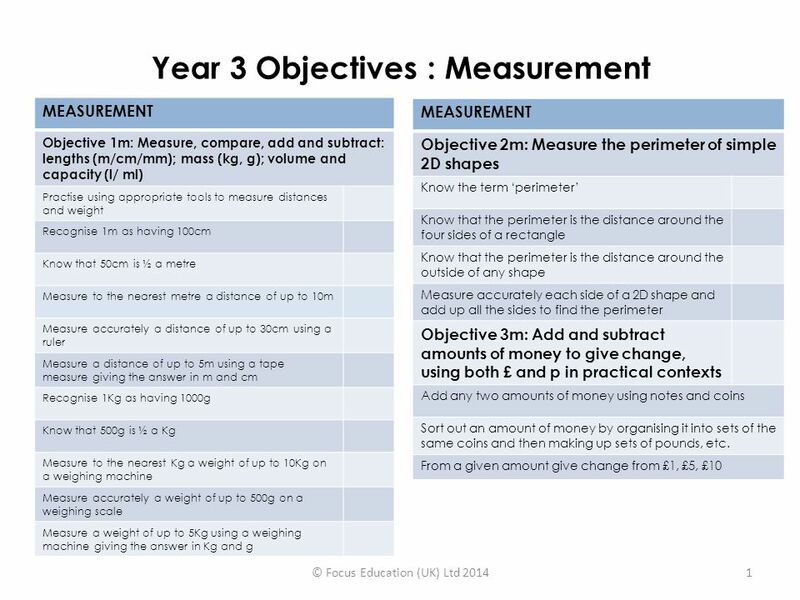 2.The ‘challenge’ concept motivates children. 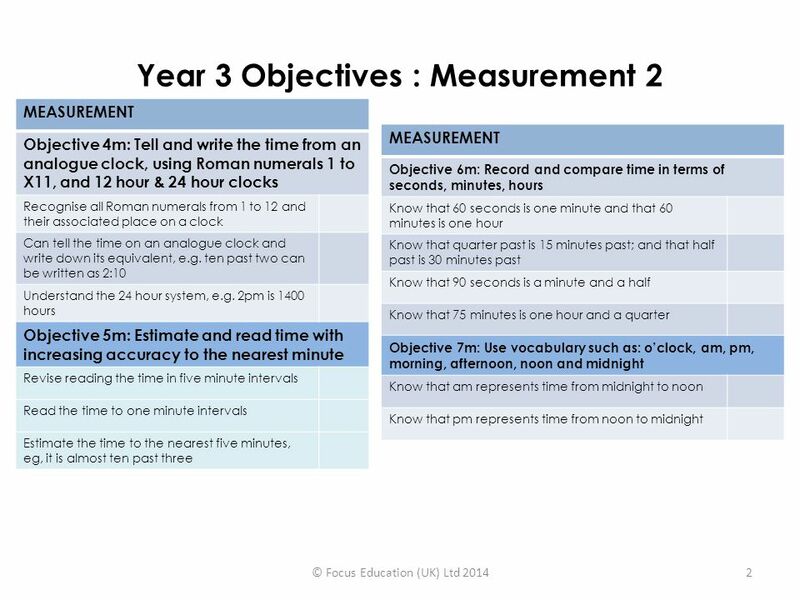 Year 3 Objectives: Number NUMBER AND PLACE VALUE Objective 1: Read and write numbers up to 1000 in numerals and words Read and write all numbers to 100. © 2012 Cengage Learning. All Rights Reserved. May not be scanned, copied, duplicated, or posted to a publicly accessible website, in whole or in part. Count to 20. Count reliably at least 10 objects. Use ‘more’ and ‘less’ to compare two numbers. Count reliably at least 10 objects. Estimate number of objects. Copyright © 2007 by Thomson Delmar Learning. ALL RIGHTS RESERVED. Time, length, capacity and volume. Measurements must have a number and a unit.